Our Biostatistics, Epidemiology and Research Design Core provides critical research design, epidemiological, and biostatistical expertise for collaborative research, education, and training in the advancement of clinical and translational research within the Great Plains IDeA-CTR network. 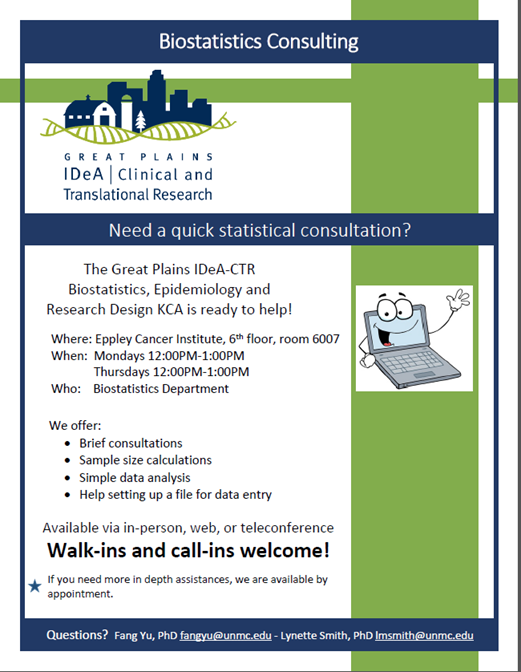 Meet with our experts for consultation and services with biostatistical analysis and other quantitative sciences for Great Plains IDeA-CTR programs. Consult and collaborate on study design, data acquisition, and data analysis. Mentor biostatistics and epidemiology faculty to develop new methodologies and tools for the study of diseases of aging in rural and underserved urban populations. Provide access to health data sets to follow indicators of health and diseases of aging. Educate and train IDeA-CTR Scholars on best strategies for study design and analysis. Review the biostatistical plan of all IDeA-CTR scholar and pilot grant application. Working with the Center for Collaboration on Research Design and Analysis (CCORDA), we are able to provide the following consulting services: research design expertise; data acquisition and management expertise; and analysis and reporting. For a complete view and description of all CCORDA services, please click here. For statistical consulting, please park at UNMC Green Parking. See below. Our courses prepare students for research roles and settings, with programs that emphasize understanding of theoretical issues and the application of disciplinary methods to the study of public health problems in settings such as academic institutions and research institutes. Academic degrees are offered and administered by each individual department and the University of Nebraska Graduate College. Click on the links below to learn more about specific offerings. Working with a Biostatistician: How should you prepare? Click here to view a 50-minute video about what you need to know when preparing to with a biostatistician. COPH Grand Rounds Click here to access news and announcements about Grand Rounds and seminars in the College of Public Health. E-Modules on Biostatistics Click here to access an interactive biostatistics instructional manual prepared by experts at the University of Nebraska Medical Center. Contact us via the Center for Collaboration on Research Design and Analysis (CCORDA) by completing the form here: Request CCORDA service.